This semester I was lucky enough to have my sister make the trip from the States to Florence for a 10 day Italian adventure. While 10 days seemed like no time to show off all my favorite Italian spots, I was able to squeeze in a lot of activity in a short amount of time. Although the sleep was minimum, the fun kept flowing. If you have family visiting you this semester here’s the top places to eat, visit, and explore! No matter what time of day, Piazzale Michelangelo offers the best panoramic view of Florence. Before making the quick walk across the Arno River and hike up from the base, we stopped at Conads. Picking up the essentials: wine, bread, and cheese, we made it up just in time for sunset! Packed with both tourists and locals alike, everyone was enjoying the amazing views, picture perfect location, and performers at the bottom of the steps serenading the crowd! If your guests didn’t know this already, Florence is a big walking (and stair climbing) city. On our second day, we reserved a place in line to climb to the top of the Duomo. It took 463 steps, through tight corridors in the interior of the dome to get to the top to enjoy the amazing view. Originally, these stairs were only meant for maintenance crew, but now they see hundreds of visitors a day! Once we finished the trek down, we rewarded ourselves with gelato and visited the 4 other monuments the Duomo ticket allows entrance to. 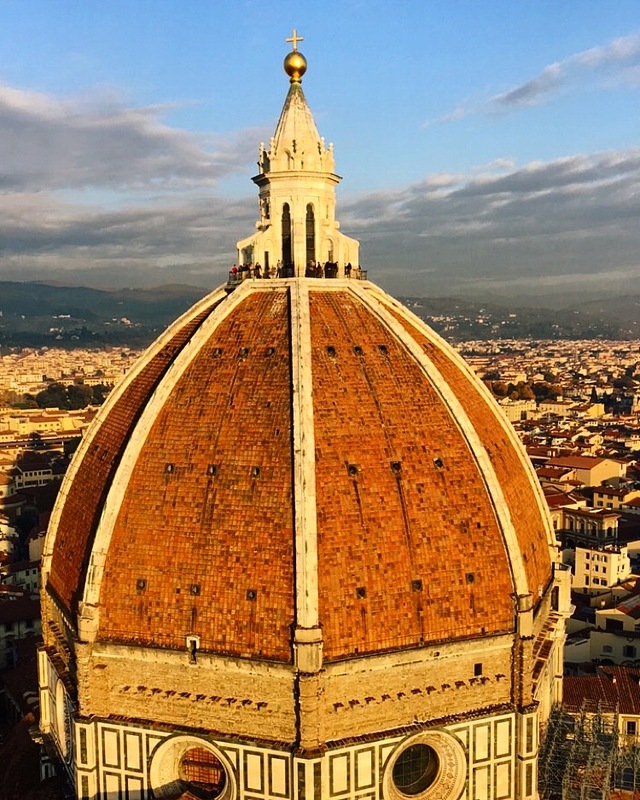 With one 15 euro ticket you can see the Cathedral of Santa Maria del Fiore, Brunelleschi’s Dome, Giotto’s Bell Tower, the Baptistry of San Giovanni, the Crypt of Santa Raparata and the Opera Museum. Directly behind the Pitti Palace are the massive Baboli Gardens. Filled with multiple statues, monuments, and greenways, we made sure to leave plenty of time on the itinerary to explore and get lost in the beauty. The development of these gardens began in the 15th century and continually expanded for almost 400 years. Visiting here is a must if you want to get away from the busy city streets of Florence. The Uffizi Gallery is one of the largest and most well-known art museums in the world. Known for the Italian Renaissance art hosted here, you can see the work of great Italian artists such as Botticelli, Michelangelo, Leonardo da Vinci, and many more. This is the perfect place to visit for the art lovers in your family. As food was a MAJOR part of my study abroad experience, I had to take my sister to all my favorites. First, Gusta Pizza. Located across the Ponte Vecchio on Via Maggio, 46, Gusta Pizza is always packed with tourists enjoying a fresh slice. If you’re lucky, they may even make your pizza in the shape of a heart like they did for us! For our final night, we went to a study abroad go-to. Osteria Santo Spirito offers authentic Italian food at an extremely reasonably price. Before your family leaves Florence make sure they try to Truffle Gnocchi! This place is often packed, so we made reservations in advance.